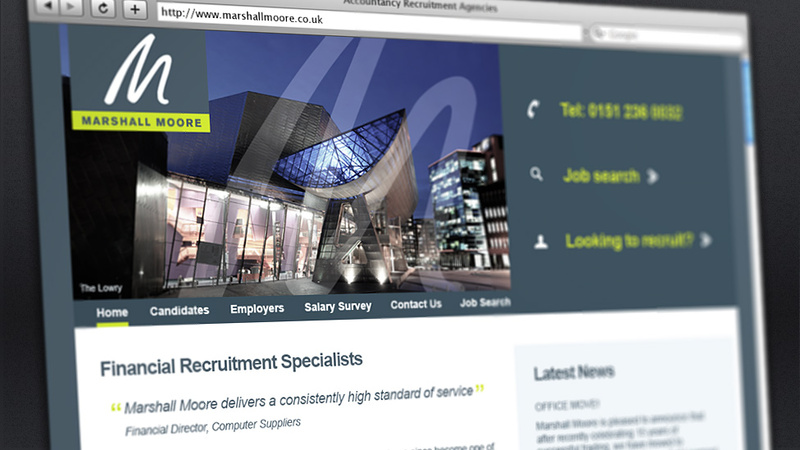 Financial recruitment specialists Marshall Moore asked us to help with updating their branding which also included re-imaging their existing recruitment website design. Marshall Moore wanted the new website design to reflect the structure of the existing website as they were not looking to change the actual content of the website in the near future. Working within these design constraints, we made sure each page template would be compatible with each of the corresponding pages on the live website. After selecting several pieces of photography to decorate their new offices – photography that reflected their roots and regions where they operated – we decided to incorporate the striking images into the header area of the recruitment website design. Subtle Photoshop treatments were applied to the photo images – some tonal adjustments and lowering of saturation were applied in order to reign in the colour palette and bring about consistency between the images and the fresh, yet corporate, website design. The hand-drawn ‘M’ of the logo was then blended into each of the images to solidify their relevance. This process, or reskin of the old website design, went extremely smoothly and both Parker Design and the client were extremely satisfied with the results. Parker were proud to be chosen as the digital agency to create a nonprofit web design that would help Future Agenda share the latest research findings, and encourage their audience to continue to debate and action.